OptiBond All-In-One gives you a simple, one-step process, with no mixing. Etching, priming, and bonding are captured in one material. Exceptional bond strength – the highest bond strength to both dentin and enamel for 7th generation, self-etch adhesives. Protection against microleakage and post-op sensitivity. Direct/indirect use. Excellent adhesion to enamel, dentin, porcelain and ceramics. Can be used on moist or dry surfaces. Contains: 1 x 5ml bottle adhesive (approximately 30-40 applications), 3 Unidose samples, 50 applicators, 25 mixing wells. Contains: 100 x 0.18ml Unidose applications, 100 applicators. OptiBond All-In-One was evaluated by 27 consultants in over 1,200 restorative procedures. This product received a 96% clinical rating. 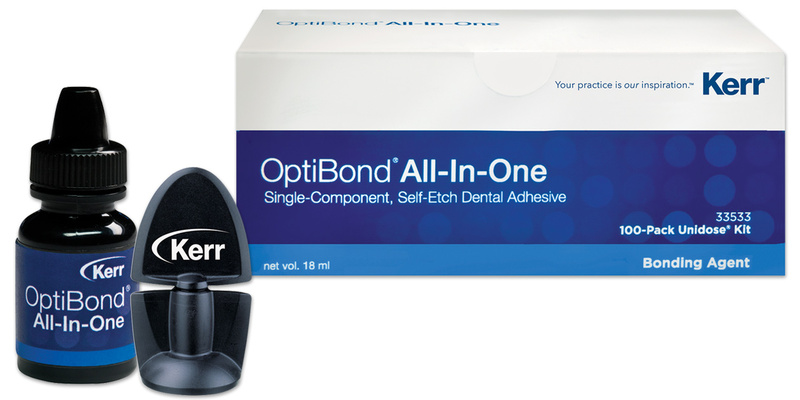 OptiBond All-In-One is a 7th-generation bonding agent and is indicated for etching, priming, and bonding of enamel and dentin in a single step for both direct and indirect procedures. Application requires two, 20-second surface scrubs followed by 5 seconds of a gentle air stream before a 10-second light cure. Consultants rated the ease of dispensing, application, and versatility of OptiBond All-In-One highly. The unit-dose package, viscosity and surface wetting also were rated very high. The time for a double application of bonding agent seemed long to some consultants, whereas others felt the process was faster since etching was not needed. The solvent in OptiBond All-In-One includes acetone which brings some odor to the product. 81% of consultants found OptiBond All-In-One equivalent to or better than their current bonding agent, 63% would switch, and 85% would recommend it to a colleague.